Zodiac Platinum DSD D/A converter brings audio appreciation to a higher level, offering the audiophile community the widest DSD support and a sample rate of 768 kHz, along with a 10 MHz input for the legendary Antelope 10M Rubidium atomic clock for an uncompromised digital to analog conversion. Zodiac Platinum DSD DAC provides the widest DSD support, including the unique 256X mode and a sample rate of 768 kHz via a custom-built USB chip. The extreme DSD256 greatly extends the accuracy and transparency of the audio reproduction as well as the overall system performance. The custom-designed Antelope USB chip compliments high fidelity by reducing clock jitter and pushing the envelope of the USB streaming with sample rates four times higher than those offered by similar devices. Whereas many top of the line DACs offer PCM upsamplers, the Platinum is the first device to offer a DSD upsampler. This distinctive feature allows the upsampling of DSD64 to DSD256, pushing DSD noise into higher frequencies, vastly improving the quality of the D/A conversion. The Platinum bypasses internal digital filters built into the DAC chip by implementing a custom upsampler with carefully designed high-precision filters in the FPGA. In the heart of the new Platinum lie the renowned 64-bit Acoustically Focused Clocking and the ultra-low jitter oven-controlled crystal oscillator, which are Antelopes signature for unprecedented sound quality appreciated by the best recording, mastering and post production studios around the world. 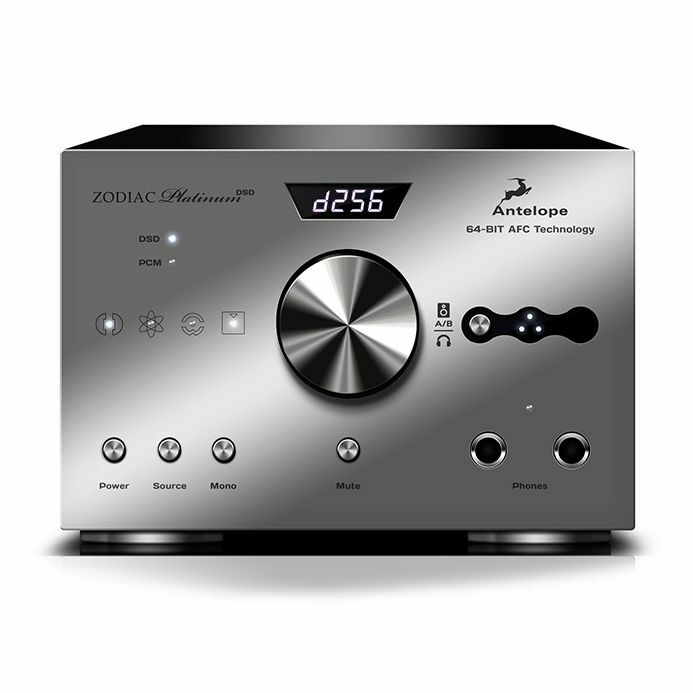 In addition, the Platinum is equipped with a 10 MHz input for the legendary Antelope 10M Rubidium atomic clock, providing the most accurate and stable clocking reference and therefore an uncompromised digital to analog conversion. Zodiac Platinum has inherited the stepped relay volume control and the dual stage headphone drivers with impedance control from its very successful and highly appreciated predecessor Zodiac Gold. The Platinum also comes with an elegant remote control and has the option for external audiophile grade power supply Voltikus. In addition to the PC and Mac control panels available in the Zodiac Line, the Platinum also offers the comfort of the remote control from a mobile application, available for Android and iOS.